The German Beer Purity Law Turns 500 and, although some question it, it is an internationally recognized quality seal. And an excellent way to test how this medieval law is still practiced today is to take my Franconian Village Beer Tour. Nearly 700 years ago the city council in Nuremberg decreed that barley was to be the only grain allowed for making malt. The reason was to ensure that enough wheat and rye for making bread was available. Brewing with wheat was a privilege and was only allowed after obtaining expensive licenses. But it was on April 23, 1516 that the Bavarian dukes William IV and Louis X decreed in Ingolstadt, “that henceforth everywhere in our cities, towns and in the countryside all beer will brewed using only barley malt, hops and water” (yeast is not included because nobody knew about yeast until Louis Pasteur’s mid nineteen century discovery). Thus Germany’s oldest food law came into force and still applies today. One reason for the new law was to protect the people from “intoxicating ingredients” such as henbane and opium poppy, instead only calming hops was to be used. Another reason was protectionism because prior to 1516 gruit was used instead of hops, but that herb did not grow in Bavaria. The Bavarian regulations of 1516 established how beer was to be properly brewed. Originally this law was only valid in the duchy of Bavaria, but in 1906 it became law throughout Germany. Brewers in Germany still follow this law today with the adapted regulation that now includes yeast and malt made from grain other than barley. Today no artificial flavors, colors or stabilizers, enzymes, emulsifiers or preservatives may be used. This makes brewing beer more complex and challenging, but if quality beer is the target then purity when brewing must be a top priority. And according to a Forsa survey from the Spring of 2014, 85 percent of Germans want the Beer Purity Law to remain in force. That alone is reason enough for Bavarian brewers to celebrate throughout 2016. The list of events is long and many breweries are planning events for this anniversary. 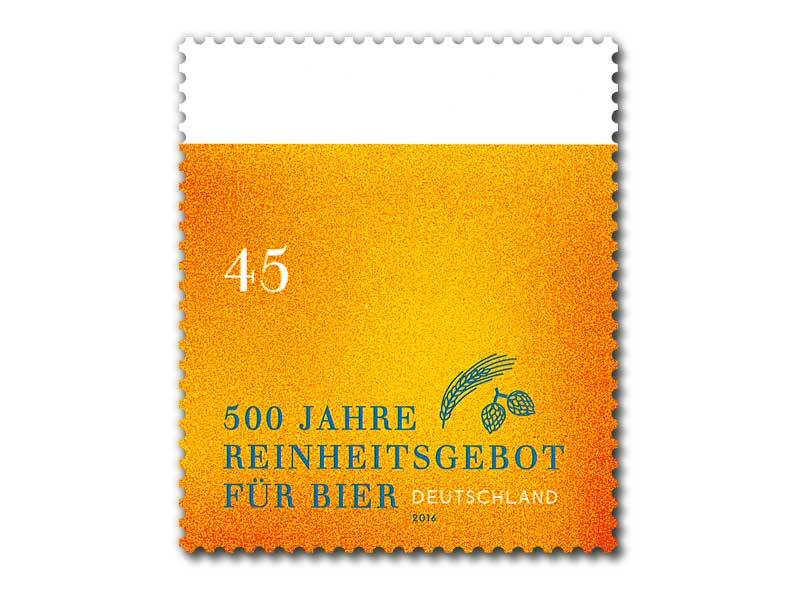 The German Post Office is even going to have a special stamp to commemorate the anniversary. For the three-day “Festival of Bavarian Beer Culture” in Munich from 22 to 24 July 2016 a large tent city will be built so 130 breweries can present their beers. Stands providing information about the brewing process and the raw materials used, as well as entertainment on three stages is planned. All across Germany, the beer industry is celebrating the big 500th anniversary with special bottle caps, labels and glasses – and of course with numerous special beers that will be brewed specifically for this birthday party. Two anniversary beers have been announced for November: a new hop Weizenbock and a Black Imperial Bock. These beers are scheduled to hit the market during the Christmas season and prove that the oldest German food law has lost none of its relevance in todays beer market. Despite only four approved ingredients for making beer in Germany, the possible flavor varieties are nearly endless because, after all, there are about 180 varieties of hops and more than 40 different malts and 200 yeast strains available. So Prost!